Even though I do like to travel, on today's post I am sharing with you the 5 things I dislike about traveling. Waiting for flights/trains/buses to get to my destination is something I find "waste of my time". If it was up to me, I would tel-transport from A to B... So much more convenient, right? Oh, this one I don't even know where to get started. I am sure all of us have encountered at least one person that falls into this category. They seriously get on my nerves. It's totally fine to be enthusiastic about being in a new place and all, but that doesn't mean you should act like a dumbass, right?! As an example, I once was in a Palace/Museum where it was stated "do not touch" some certain items or photograph them. Guess what some assh*le did?!.. Exactly! And that's it for me!! 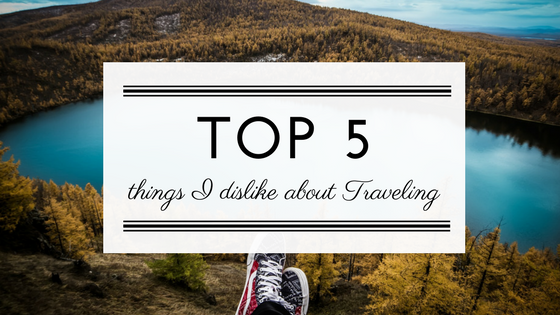 If you'd have to point out 5 things you don't like about traveling, what would they be? Concordo contigo. Sobretudo a parte de desfazer a mala e da espera por voos. Que desespero! Packing and unpacking is just pure hassle. Just bung it in and go!